'Offensive,' 'Sad': Reaction To Huckabee's Holocaust 'Oven' Reference : It's All Politics Presidential candidate Mike Huckabee said over the weekend that President Obama's Iran deal is so bad it will "take the Israelis and march them to the door of the oven." Former Arkansas Gov. Mike Huckabee at the Family Leadership Summit in Iowa earlier this month. 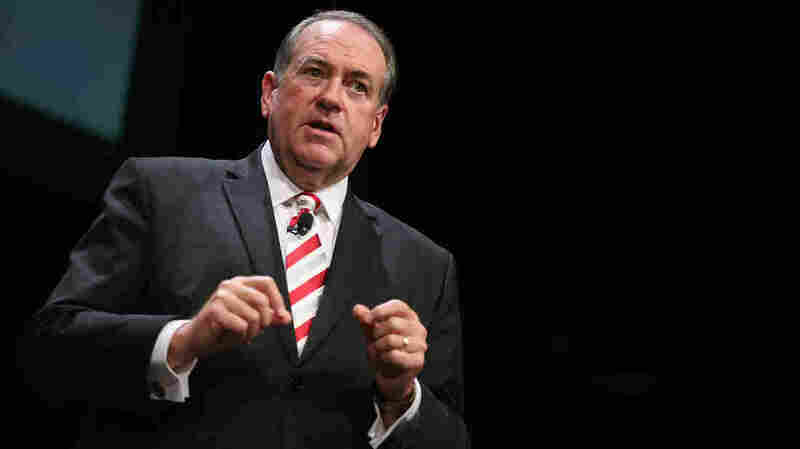 Presidential candidate Mike Huckabee said over the weekend that President Obama's Iran deal is so bad it will "take the Israelis and march them to the door of the oven." Candidates, politicians and groups were quick to denounce — or defend — the Holocaust reference. "This president's foreign policy is the most feckless in American history. It is so naive that he would trust the Iranians. By doing so, he will take the Israelis and march them to the door of the oven. This is the most idiotic thing, this Iran deal. It should be rejected by both Democrats and Republicans in Congress and by the American people. I read the whole deal. We gave away the whole store. It's got to be stopped." President Obama hit back at Huckabee during a press conference in Ethiopia, calling his comments "part of just a general pattern that we've seen that would be considered ridiculous if it weren't so sad." The president spoke about what he called a "general pattern" of rhetoric on the Republican side — most notably in the controversial comments made on the trail by Donald Trump. "We just don't fling out ad hominem attacks like that, because it doesn't help inform the American people," the president said. "Maybe this is just an effort to push Mr. Trump out of the headlines, but it's not the kind of leadership that is needed for America right now." Huckabee defended what he said Monday, releasing a statement and tweeting, "For decades, Iranian leaders have pledged to 'destroy,' 'annihilate,' and 'wipe Israel off the map' with a 'big Holocaust.' "
Trump's special counsel Michael Cohen said Monday he doesn't think Trump is offended by Huckabee's comments. Cohen, who said his father is a Holocaust survivor, told CNN, "We've been there. ... I can tell you — there's that old statement, 'Never again.' What Trump is trying to say is a nuclear Iran is the destruction of this world. What we need is a strong America." He added, "I'm not offended by the words. What I am is I'm concerned. I'm truly concerned for the safety of not just this country but the countries all around the world." Former New York Gov. George Pataki, who is also running on the Republican side, tweeted: "Agree with @Potus that @GovMikeHuckabee remarks are 'sad,' unfortunately, it comes from the most divisive President in history #OneAmerica." Democratic candidate Hillary Clinton addressed the comment in Iowa Monday, saying, "I'm disappointed, and I'm really offended personally. ... I find this kind of inflammatory rhetoric totally unacceptable." Maryland Democrat Martin O'Malley also called the comments "offensive." Advocacy group the Anti-Defamation League said in a statement, "Whatever one's views of the nuclear agreement with Iran ... comments such as those by Mike Huckabee suggesting the president is leading Israel to another Holocaust are completely out of line and unacceptable." "Republicans have fallen over themselves to speak out against Donald Trump's outrageous rhetoric on immigration and veterans. Will they now do the same and speak out against this unacceptable attack against President Obama that smears the memory of Holocaust victims, as they did when Trump attacked Sen. John McCain (R-AZ)? Or will they stand by in silence and implicit approval? We call on every candidate to condemn Gov. Huckabee's disgusting statement and to show where they truly stand." Rabbi Marvin Hier, founder of the Simon Wiesenthal Center, called Huckabee's language "very harsh" and "over the top," though he also called the governor "a great supporter of Israel." Asked by CNN if he had advice for Huckabee, the rabbi answered, "I would advise that no president of the United States should be compared in any way to Adolf Hitler."